Many beliefs found in the world of the organized Christian church are based upon certain assumptions, which in some instances, have led people down the wrong path or the wrong mindset. This is why so many traditionalists will sound the alarm and issue “grace warnings” whenever they hear about faith-based righteousness that comes apart from the law of works. It will be beneficial for us to shift to an entirely different paradigm in order to rethink many foundational teachings we’ve been bombarded with over the years. As we do this, and begin growing in our understanding of the gospel of grace, we start to see things from a fresh and new perspective. We’ll even begin to realize some of the inconsistencies and contradictions found within our (previous) belief system. One example from this week’s program: The New Testament page, found between the books of Malachi and Matthew. 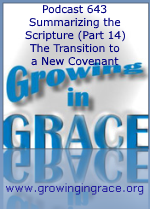 The New Covenant/Testament did not begin with the birth of Jesus, but after He died. Begin to transition into realizing that much of what Jesus taught was not a new Christian teaching for believers living in a New Covenant, but was ministry aimed at the Jewish people who were still under the law. They were without life, and in a hopeless situation living under the command. They needed something new. They needed Jesus to do the will of God and fulfill the law on their behalf. During this week's program we mentioned the twenty-part Growing in Grace podcast series that we'd recorded a couple of years ago entitled "Why Jesus Taught Two Covenants." 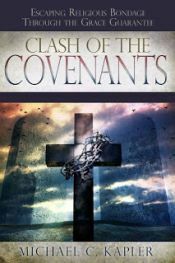 In that series we (obviously) went into much more detail on Jesus' ministry to the Jews who were under the Old Covenant. Here's a link to Part 1 of that series in case you're interested in listening to it. (Then click on "Newer Post" to hear each subsequent part of the series).